The cool air brushes my cheek, and I am glad for the cardigan I had pulled on before stepping outside into the evening breeze. Our private backyard feels cozy, and the neighborhood is surprisingly void of the clamoring din surrounding most nights. I rest my head on the back of the chair as the sun disappears below the horizon. Pinks and oranges slowly transform to purples and blues, streaked with grey clouds. For a short while longer, I am alone. White wine balances in my left hand and my eyes trace the outline of black trees against the backlit sky. My mind wanders: making to-do lists, agonizing over parts of my day and organizing my tomorrow. It takes several minutes of uninterrupted space to see them. At first, just a disturbance in my periphery. But at the insistence of dotting my foreground, I can't ignore them. Taking a moment to focus, I finally see what has been pestering my internal soliloquy. Dots of light breaking through the darkness for moments, only to disappear the moment my attention turns to them. 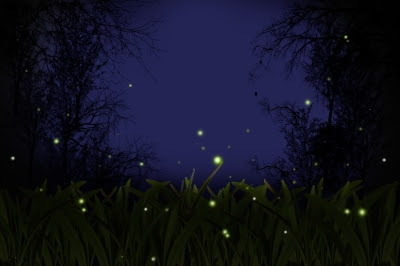 Despite my hatred toward bugs, fireflies will always be nothing short of magic. These I give permission to fly close, to land on me. These lightening bugs cause me no fear, no revulsion. Memories of youth flood my thoughts, their tendrils tickling photos in my mind long locked away. Amber nights from my childhood, small feet chasing twinkle lights in the night air. As a child, I could not wait for dusk before I could find my flying friends. I never missed their first blink. Yet, how long had I been outside tonight before I'd noticed them? How many minutes had they been dancing before they caught my eye? It's a reminder that I'd passed a threshold long ago. A child would have stepped one toe outside and, in all of her innocence, immediately found the lighted bugs. A child longs to see the magic, a child can't deny the persistent blinking. Tonight, I sat outside in the dark and refused to see the beauty. Because I, like most adults, have become distracted, anxious, hardened, cynical. At some point in time, we stop trusting magic and struggle to believe: in Santa, in the tooth fairy, in everyday miracles, in the goodness of people. We see the commercialism in Christmas, the backhanded compliment, the worst in other humans. And we take far too long to see the fireflies. My daughters still believe in magic. They haven't lost the ability to remove themselves from the grind of the world, to truly experience moments of life. Their eyes always see the beauty. Their hearts always trust. They see the dreams in every day, mundane things. And in so many ways, I envy them. I long to see the world through their eyes. So I tonight, I tried. I pushed aside the to-do lists, the anxiety, the stress. I stopped my mind from churning. And the moment I allowed myself to truly breathe, I started seeing more and more fireflies. First one here, then there. Then five. Then fifty. Then more than I could count. Before long, my vision was overwhelmed by them. It occurred to me that the population had not grown as darkness fell. Rather, they had been there they whole time. I'd just not stopped long enough to see them. And once I let myself see them, I couldn't not see them. How much more am I missing in life? What other beautiful things might I see if I just allowed myself the time, the freedom, to see them? What magic might reenter my life and color the way I see the world? What moments might I no longer miss? I made myself sit in the stillness. The sky grew darker, the air grew cooler. And the beautiful lights danced before me. I sat, mesmerized by their brilliance. Longing for all that I'd missed before actually seeing them. Vowing to open my eyes wider, not to let the magic moments of life pass me by. Oh that the chaos of my life be stripped away, so that I'd never again miss the fireflies. This is absolutely beautiful!!!! You should write a book! I'm so glad you found me from Mom of the Year! Thank you for sharing this! Pinning and sharing on our facebook page!!! Lovely post, Steph! This is precisely the reason that I put down the computer, put down the cell phone and am much more in the moment during the hours that my daughter is awake. 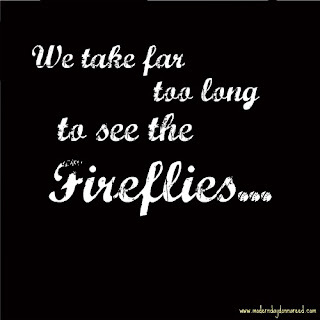 I don't want to miss the "fireflies" because I'm busy tweeting or updating my Facebook status. I realized that I'll never be able to get back the time that I lose by not being mentally available for her, and while my virtual friends might "like" what I say, my online presence isn't key to their existence. It's very much opposite with my daughter! This post is a great reminder of that!